I previously shared my 2016 summer dad-shirt catalogue, but this Star Wars shirt (aka Stormy) is one of my favorites. It’s my go-to weekend shirt. I wear it around the house, while grabbing Saturday coffee, or when I just want to look and feel baller-shot-caller. In fact, I was brave enough to wear this shirt one time with a blazer at a semi-formal event and it received non-stop compliments. I sat back and let the shirt do the talking. 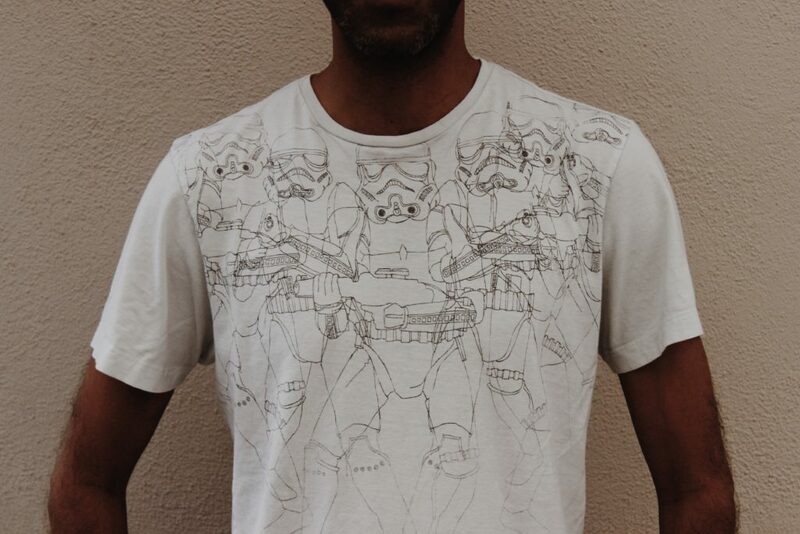 I mean, just look at the intricate storm trooper linework. Just look at it. My wife, however, hates to look at it. “Please calm your voice, Sir” said the checkout lady at Ross. A few months ago, I walked into our garage, and sitting at the top of two paper shopping bags, was my Star Wars shirt. “This is a weird place for Stormy,” I thought to myself as I picked him up. I walked back inside and asked my wife what he was doing in the garage. I mean, it was a bit faded so perhaps she was experimenting with a new whitening agent for the family? It was plausible, but highly questionable, since I do my own laundry. “Oh, that’s for the donation pile,” came her answer. “Please put it back where you found it,” she asserted. “Oh, I will,” came my response. I promptly went back into the garage and picked up the bags. I walked back in looking directly into her soul, and without breaking eye contact, put my Star Wars shirt and the others back in my dresser where they belong. “NOT ON MY WATCH!” I shouted. So if you see me wearing Stormy on consecutive days, you now know why. I can’t take any more chances around my wife. Does your sig-O want to get rid of anything of yours? Comment and let me know! Follow the shenanigans on Facebook, Instagram, and Pinterest. Or email me directly to say hello!